Months ago, Sarasota County Commissioner Alan Maio began mentioning that it was coming. On Feb. 28, staff won unanimous board approval to make it a reality. Maio made the motion to hire Calvin, Giordano & Associates Inc. for $285,000 to undertake the work, which would “commence immediately,” Osterhoudt noted. The firm’s corporate office is in Fort Lauderdale. The timeline calls for the project to be completed in 18 months, Osterhoudt said. The plan also calls for illustrating the document with “effective graphics” and ensuring it is consistent not only with the county’s Comprehensive Plan but also with federal and state laws. Osterhoudt likened the first step of the project to “a discovery phase,” during which the consulting firm will research all the necessary codes and other material and meet with a variety of groups to develop “an annotated outline of identified issues, a refined outreach plan and a draft of the proposed [Unified Development Code] structural outline,” according to a slide he showed the commissioners. The second phase will call for consulting firm to move “to the full engagement effort” with community members; that will include surveys, meetings and public workshops. The third and final phase will encompass the formal public hearing process before the Planning Commission and the County Commission, Osterhoudt said. April 6, when the Planning Commission will meet at 6:30 p.m. in the Commission Chambers at the County Administration Center located at 1660 Ringling Blvd. in downtown Sarasota. April 10, when the Board of Zoning Appeals will hold a session at 6 p.m. at the County Administration Center in Sarasota. April 19, when the county’s Development Service Advisory Committee will meet at 2:30 p.m. at 1001 Sarasota Center Blvd. 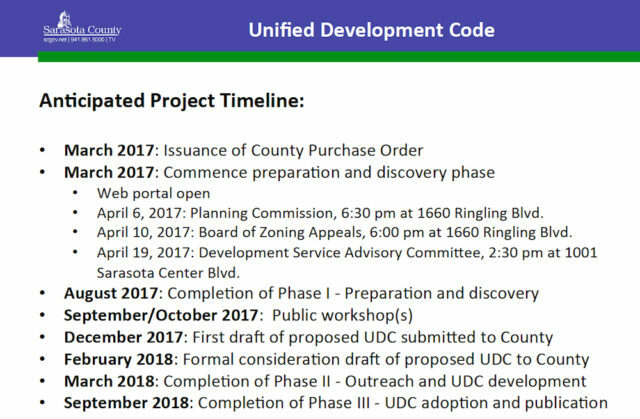 The schedule calls for county staff to receive the first draft of the proposed Unified Development Code in December. If all goes as planned, the document will be adopted and published in September 2018, Osterhoudt noted. Staff already has created a web portal on the county’s website, Osterhoudt explained, so members of the public can provide comments and read monthly reports on the progress of the work. 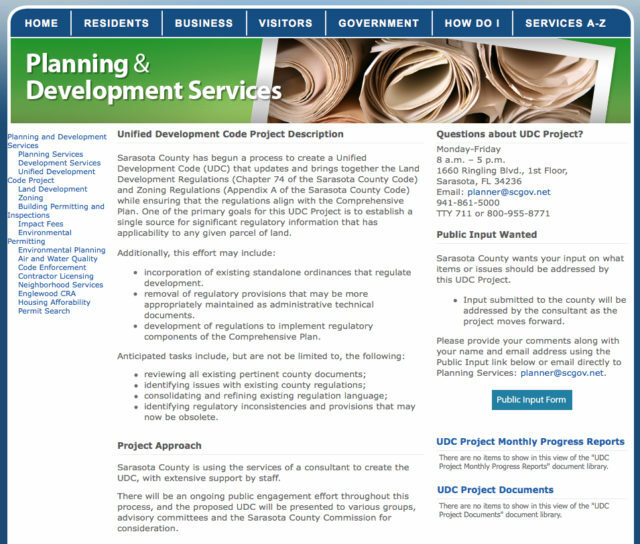 The webpage may be accessed easily by clicking on “Unified Development Code Project” under the Initiatives heading in the lower left-hand corner of the county’s website, he added. The portal includes links to the Land Development Regulations chapter of the Sarasota County Code and to the Zoning Regulations appendix. It also features a link to a form for public comments. “We’ll give [those] right to our consultants,” Osterhoudt noted of the forms. “I just think it’s an extremely aggressive timeline,” Commissioner Mike Moran told County Administrator Tom Harmer. 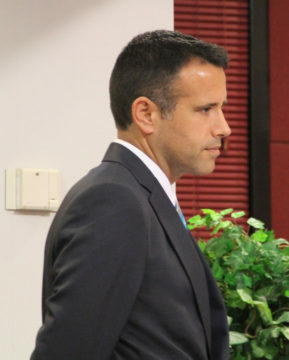 Because the board members can direct only the county administrator and county attorney to take action, and not staff, under the terms of the County Charter, Moran asked Harmer to be sure to inform the commissioners if it appears the consultant and staff cannot adhere to the proposed schedule. “Perfect. Thank you,” Moran told him.